Frederick Herzberg in his publication “The Motivation to Work (1959)” claimed that he executed examinations to determine which elements in an employee’s work environment triggered satisfaction or dissatisfaction. Herzberg developed the two-factor theory of motivation from an outline learned in nearly 4,000 interviews. When questioned what “turned them on or pleased them “about their work, participants spoken primarily about elements pertaining to the nature of the work itself. Herzberg calls these “satisfier or motivation factors”. When questioned what “turned them off or unpleased them” about their work, they spoken more about things pertaining to the work setting. Herzberg calls these “ hygiene factors ”. 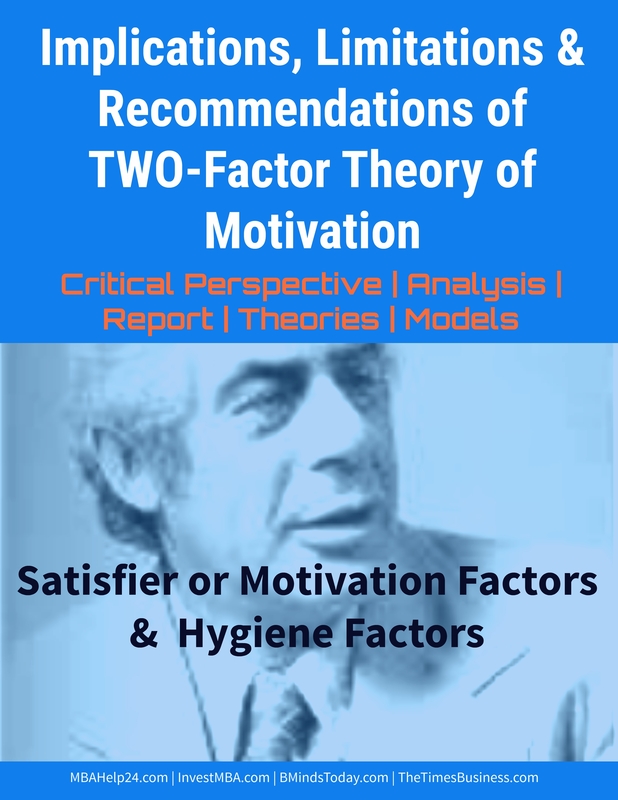 Herzberg in his model suggested that the two-factor theory of motivation impacts people in various modes. High Hygiene + High Motivation: The perfect situation where employees are greatly motivated and have a small number of criticisms. High Hygiene + Low Motivation: Employees have a small number of complaints, on the other hand are not greatly motivated. The job is regarded as a pay check. Low Hygiene + High Motivation: Employees are motivated but have a great deal of complaints. An environment where the job is thrilling and inspiring but pays and work environments are not up to par. Low Hygiene + Low Motivation: This is the poorest situation where employees are not motivated and have a lot of complaints. Intellectuals have criticized Herzberg’s model as being method-bound and complex to reproduce. Job context- the work setting where they perform it. Fixing poor and uncooperative company rules and policies. Providing effective, helpful and non-intrusive control. Building and supporting a culture of respect for all people. Making sure that wages are competitive. Building job position by providing meaningful work for all designations. Providing employment safety and security. Providing opportunities for superior accomplishments. Generating work that matches people’s expertise. Providing training and development opportunities to chase the positions people want within the organisation. The Two-Factor theory suggests that the managers should focus on ensuring the acceptability of the hygiene factors to avoid employee dissatisfaction. Furthermore, the managers must make certain that the work is motivating and rewarding so that the employees are motivated to work and perform firmer and better. This theory stresses upon job-enrichment because this particular practice helps to accelerate employee motivation. The basic purpose and characteristic of a job is to make use of the employee’s expertise and competencies to the maximum. A continuous concentration on the motivational factors can strengthen work-quality. The two-factor theory’s dependability is unreliable. Study has to be prepared by the raters. The raters may make a fuss over the conclusions by evaluating similar answer in diverse mode. Herzberg’s two-factor theory overlooks situational variables. Herzberg in two-factor theory assumed a connection between satisfaction and productivity. But the study focused on satisfaction and overlooked productivity. Failed to use a comprehensive measure to assess satisfaction. An employee may find his/her job satisfactory despite the fact that he/she may dislike part of his/her job. It is not free from prejudice, as two-factor theory is based on the normal response of employees when they are enquired the bases of satisfaction and dissatisfaction at work. They normally fault dissatisfaction on the external factors such as pay structure, and firm policies. Similarly, the employees give credit to themselves for the satisfaction factor at work. Regardless of these boundaries or limitations, Herzberg’s Two-Factor theory is acceptable broadly.